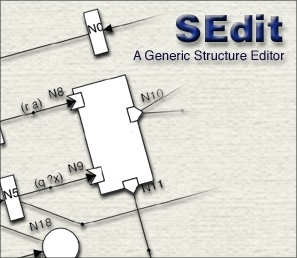 SEdit is a software tool for the design and animation of structured diagrams represented as graph-like structures. Different models can be freely defined in XML formalisms description files and can have associated Java classes for specific display or simulation behavior. SEdit is embedded into the MadKit multiagent platform but maybe used as a standalone application. Thus SEdit may use all the features of the MadKit software: it is possible to communicate by message passing between diagrams, even if these diagrams are distributed over the network.It is also possible to create MadKit agents using specific SEdit formalisms. SEdit may be used either as a stand alone application, or as an extension of MadKit. In figure 1, SEdit is seen as an extension of MadKit. SEdit diagrams are seen as agents and all operations and surveillance of agents within MadKit can be applied to SEdit diagrams. SEdit is part of the Warbot system !! The figure 2 shows a typical application of SEdit used as a stand alone application. Diagrams may be created, saved and runned without resorting to any multiagent application. SEdit, did not have its own pages..Now this is fixed. You will find here all information about SEdit. SEdit is availaible both in standalone and MadKit embedded version. Download the standalone version on this and go to the www.madkit.org to download the embedded version which is part of the MadKit distribution.